Quiltville's Quips & Snips!! : The Scrappy Bargello Dance–Tennessee Style! Fast and furious sewing y’all! 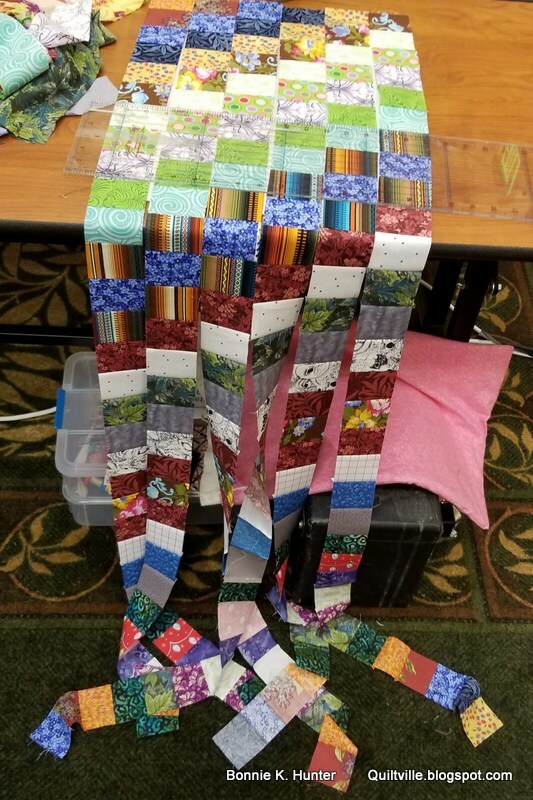 Yesterday’s workshop was a flurry of strip piecing activity – and folks who had never made a bargello quilt before found themselves falling in love with how simple and fun this pattern is – and the ideas for what they can do with it were percolating! How much can YOU accomplish in a 6 hour sewing workshop day? These two are here to show you! The lap size takes 32 strips in length – 128 strips total for 4 panels. Once the panel is sewn, press every other strip open in both directions. Tag team panel pressing in action! Busy class to the max! When pressed – take the bottom strip and sew it to the top strip so your a panel is now a “circle.” Sub-cut the panel into 6 2-1/2’’ widths. Starting at the left – working to the right! Open up the first strip set between two squares where desired. Stair-step the next strip set either up one square or down one square and open where desired. Follow suit with the other 4 strips in the panel….We were making the lap quilt size, so it was 2 uphill panels and 2 downhill. You can find ALL of this info in the Scrappy Bargello pattern found under the free patterns tab. Have YOU made one? Sorry about my over zealous whooohoos and intermittent singing...I can't help myself! Evidently neither can my students! A Jelly Roll will make 2 panels! For the lap quilt – grab TWO Jelly Rolls! The end of class hallway lay-down-show-down! It was a wonderful day with some absolutely terrific women and I still have 5 more workshops yet to GO at this event. Whew! 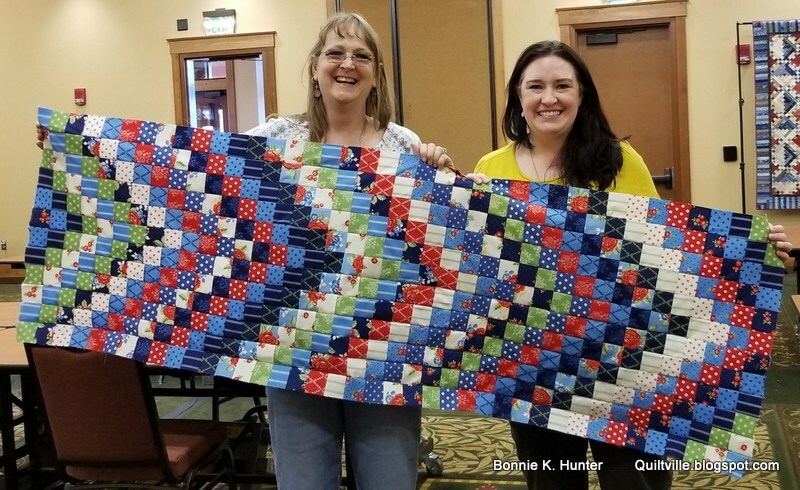 Today’s Idaho Square Dance workshop from the Addicted to Scraps book will be followed by a fun evening workshop of Basket-weave Strings from the Free Patterns tab. Let’s get this day going – full steam ahead! If that if our focus, that is what we will find! 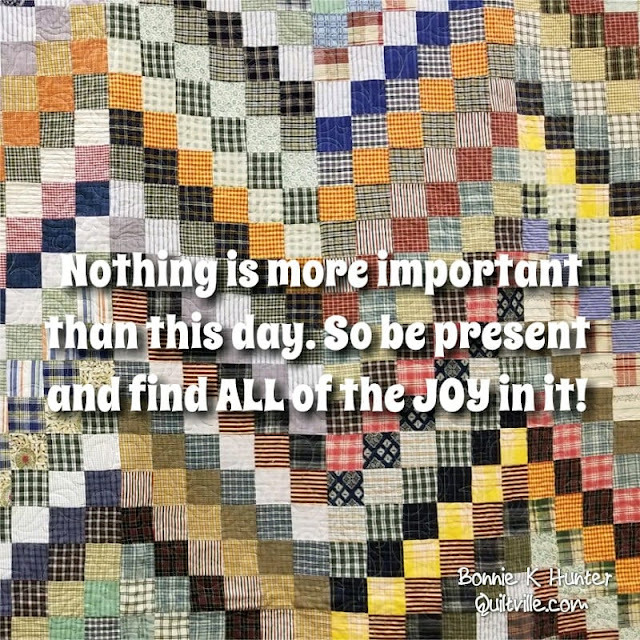 Have a terrific Thursday, quilty friends! WOW! I never knew a Bargello could be so easy! I had always imagined piecing those little squares one by one! LOL! Thank you for showing us how easy it is! Loving your blog. Definitely trying your Bargello method. What an amazing and probably exhausting week you're having in Pigeon Forge. You're are a quilting phenomenon - inspiring us each and every day. That video is great! What a fun group. I noticed that even the women not dancing were enjoying it! Great quote for the day. Gotta get up and move! Quiltmaker did a fun Quilter's Shuffle at Block Party in 2013, Remember? That looks like so much fun!! Thanks for sharing! Yes ,have made this quilt before using your pattern. Sooooo much fun. That ''quilt'' laid out on the floor looks fantastic. Congratulations Bonnie and to all your students . This quilt has been catching my eye lately and I have to make it now. I started collecting mens shirts because I love that look for it. I am finding mostly lighter colors and am hoping to find some nice warm medium and darker plaid cotton shirts. The search will be fun.